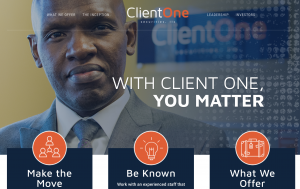 Announcing what’s next for Client One Securities. As promised, we’re continuing to improve our technology in 2018. Laser App Enterprise. Need to update bulk client documents from the purchase of a book of business? Save time with bulk forms, e-sign ready forms, and a mobile-friendly platform. Advisors Asset Management. With this service, you’ll have direct access to fixed income markets, structured products, and unit investment trusts. Learn more about these offerings at www.aamlive.com. At our core, we’re the same broker-dealer you’ve always respected, and that will never change — we’ve just refreshed our look. Take a look at our new website. (Online client access to accounts through NetXInvestor is still available too). This cutting-edge wealth management technology is our solution for all data aggregation and reporting needs. This solution allows us to create a global dashboard of your Client One assets, which will include all custodians, all direct accounts and all security types alongside CRM capabilities. In addition, clients will have their own access to both a desktop and mobile app client portal displaying all relevant account information. Watch your email in upcoming weeks for a webinar on training and onboarding. If you want to get started with DocuSign or Laser App, send an email to Jake Tyndall, New Business Recruiter and Onboarding Specialist at [email protected] or call 888.909.9399. © 2018 Client One Securities, LLC.